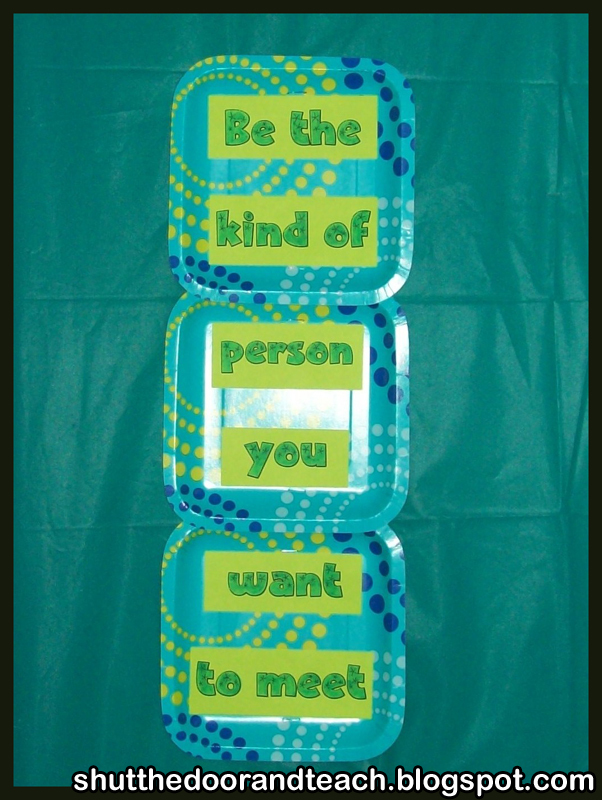 Shut the Door and Teach: New Character Education "Poster"
I saw this phrase and I thought it embodies the sort of prosocial, make-your-school-a-better-place sort of mantra my principal wants. I'm the type of person that LIKES inspirational quotes, but I fear the idea of littering my room with them to the point that they lose meaning. 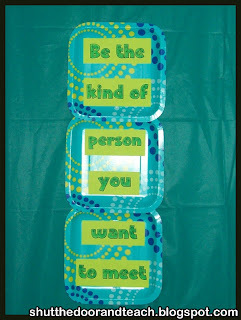 So it was with careful consideration that I chose, "Be the kind of person you want to meet." First of all, the squares are actually paper plates from Target! They match my classroom colors and they were on sale. I still have a few more that I'm sure I'll find use for (I'm thinking a bulletin board heading). Next, I went through a bunch of free fonts I downloaded from daFont. After printing on lime green paper and trimming them, I used Post It note glue to attach them to the plates (so I can reuse the plates if I need the plates for something else later in the year). And viola! An eye catching sign with a positive message. Love this! Short and sweet - and DEEP at the same time.